Moore and I featured in a 2000 newspaper article. Over the past 17 years I’ve been able to engage many wonderful people in the development of West Virginia Explorer, but there’s one person who I can confirm we could not have survived without — Jonathan Moore. He was here at the beginning when I had nothing to work with but concept. He was a kid, fresh out of school, and had no preconceptions about what I needed to accomplish, which is exactly what I wanted in a Web developer. I’d dealt with enough arrogance among developers already. His ability to tolerate my habits as a magazine publisher must have been a trial: I knew what I wanted, but bandwidth in 2000 couldn’t accommodate the image-intense formats to which I was accustomed. He was patient. Times were tough. Too few people understood what a website could accomplish, so advertising revenue was scarce. I gave him my car as payment. Moore returned again in 2014 to help pick-up pieces. The website had been torn asunder in a series of tech and legal mishaps. Calmly, he rescued 12 years of work from oblivion as I sat helpless, watching him bring files back to life. Despite his efforts, it would take another year for the World Wide Web to re-learn what WVExplorer.com had been and another two to begin to recover its rankings. Through the period there was little we could do but wait. Now, seventeen years after I first darkened his doorstep, the unselfish and unassuming master of the Web has returned to patiently help take the guide to the next level. We’ve enjoyed record rankings since, and within the past month we’ve watched traffic triple. Many mornings I wake to find that 2,000 visitors or more had used the guide the day before to arrange vacations and discover West Virginia. It’s heartening to know we have that kind of economic influence. Over the next few months I’ll be introducing more of the incredible people who have contributed to the guide — writers, designers, photographers, benefactors, and advertisers who have gone above and beyond to support our work. In the meantime, I’d like the many West Virginia organizations who work with us to know who has their back — Jonathan Moore. P.S. 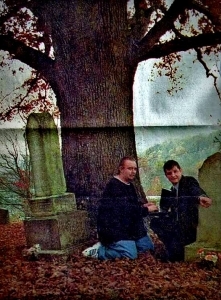 Jonathan Moore is also the founder and editor of the online guide to the paranormal West Virginia Ghosts, which he established in 1999. If you’ve a taste for the eerie backstory of West Virginia, be sure to bookmark the site and join its corresponding social media. Journalist, historian, and proponent of inventive economic development in West Virginia, David Sibray is founder and publisher of West Virginia Explorer. For more information, he may be reached at 304-575-7390.